Mary Katrantzou Jewel Tree dress: multicolored printed velvet, crystal, bead and pale-pink acetate flower latticed appliqué, high round neck, cropped sleeves, fitted waistband, structured peplum-style padded skirt, vent, fully lined. Concealed zip fastening through back. 82% viscose, 18% silk; lining: 85% cupro, 15% Lycra. Specialist clean. Mary Katrantzou's appliquéd velvet dress is a dramatic investment piece from one of the hottest FW11 shows. Immaculately tailored with a nipped in waist and a structured skirt, this printed style epitomizes the designer's keen use of color and embellishment. Keep accessories to a minimum, simply adding platform pumps and a cocktail ring for a show-stopping look. 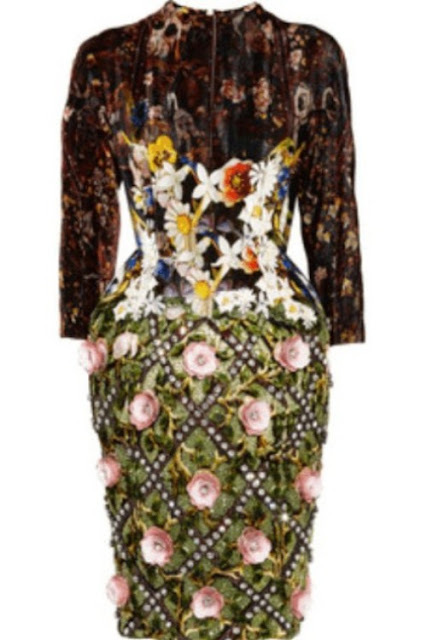 Read also other information about Mary Katrantzou Dress design - Jewel Tree appliquéd velvet dress in fashionbeautytrends.com.